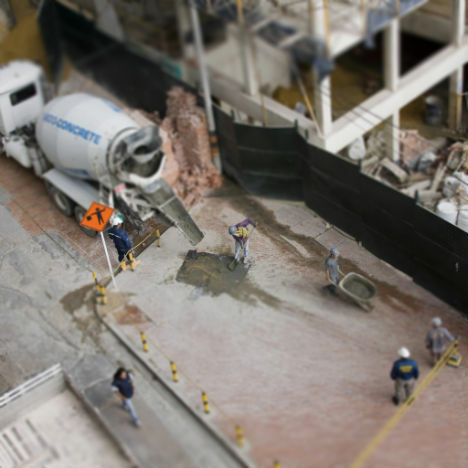 It’s a case of life imitating art: photographs of full-sized objects or scenes that look like tiny, perfectly constructed models. 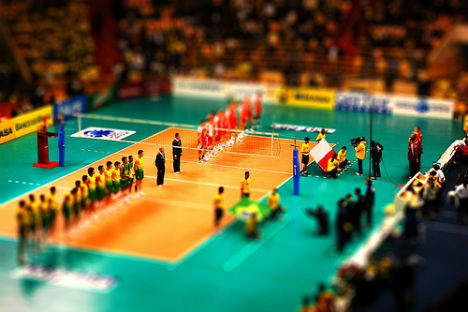 Tilt-shift photography, whether using a real tilt-shift lens or Photoshop, creates a “fake miniaturization” effect that tricks the eye with shallow depth of field and high camera angles. Take a look at these 15 images and you’ll find yourself wondering how the artist convincingly reproduced such tiny objects before realizing that they’re larger than they appear. 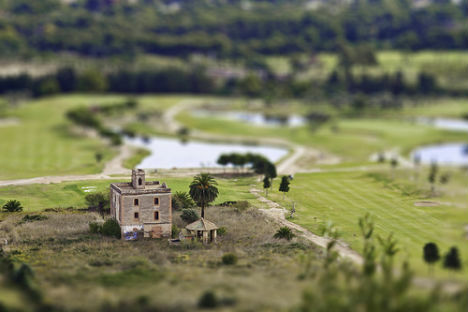 Looking at this photo by Juan Pablo Mejia, it’s hard to believe it’s not a real miniature. Down to their little hard hats and tools, this construction scene seems like a bunch of meticulously sculpted and painted figurines with power lines as thin as thread. 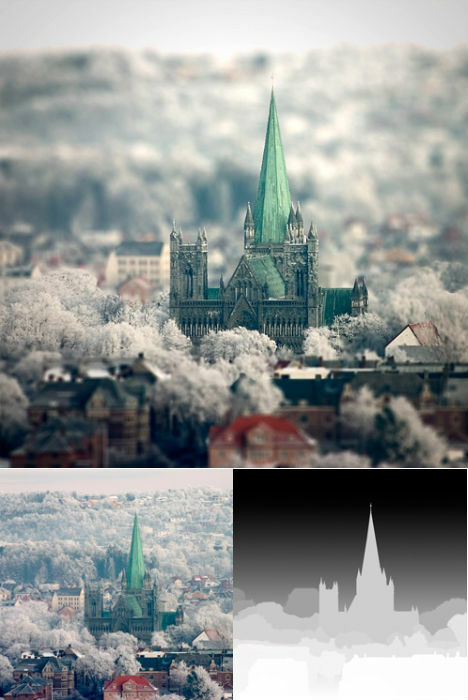 The trees on this image of Norway’s Nidaros Cathedral look as if they were crafted from lichen, but artist Ola Endra Reitstoen created it by first making an ‘alpha channel’ to represent the distance to the objects in the photo, starting with a gradient from white to black “and then tweaking the gradient to better represent the distance to the buildings in a better way,” she explains “Then apply the Lens Blur filter to the original, and use the ‘alpha channel’ as a depth map.” Reitstoen provided the depth map to demonstrate her technique. 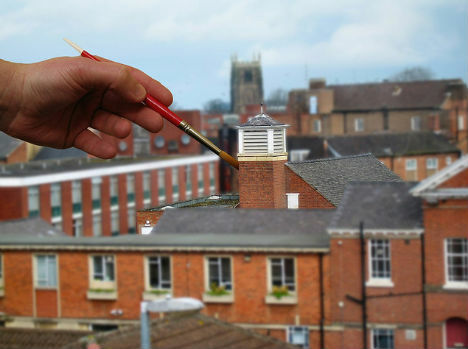 The saying ‘painting the town red’ gets a new meaning in this image by Matt West, in which the photographer has used both forced perspective and selective blurring to make it look as though he is touching up a tower in the town of Loughborough, UK. 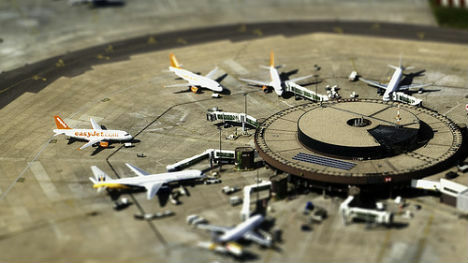 Progressively blurring a photo from the center out toward the top and bottom is one of the most effective ways of producing a fake miniature, as seen in this photo. 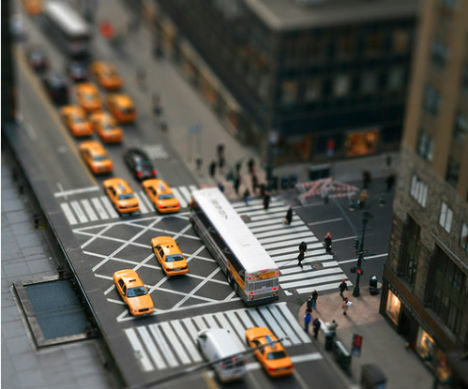 As in this image of New York by Ian Payne, the shallow depth of field makes it seem like a close-up photo, tricking the eye into believing those yellow cabs are the size of a quarter. 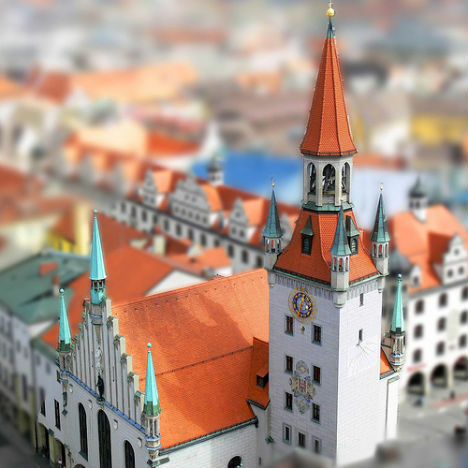 To achieve sharp focus on the front tower, photographer Rolo Hauck cut and pasted the foreground and blurred the rest. 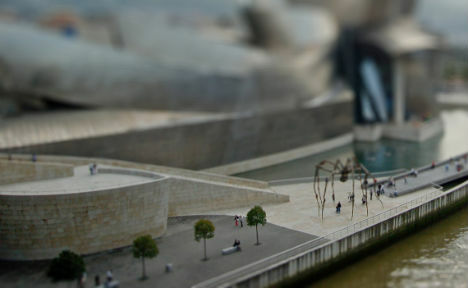 The Guggenheim Bilbao spider sculpture is reduced to the size of a real spider in this fake-miniature photo. The artist used a pre-made filter to achieve the effect. 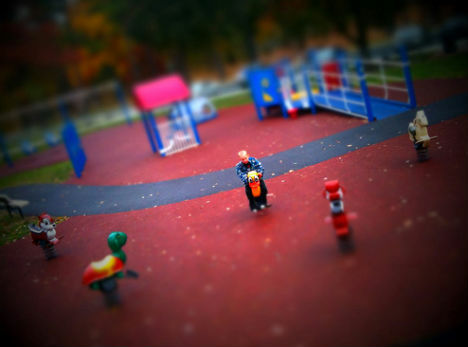 Even the iPhone can create fairly convincing fake-miniature photos with nothing but a simple filter, like this one by George Ryon. 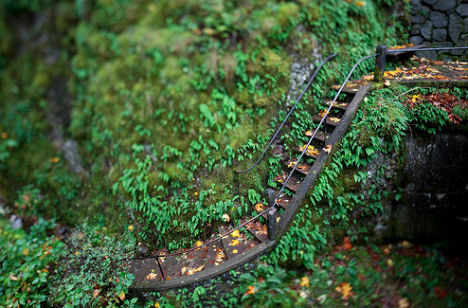 Handrails that look as thin as wire and the intense green of the foliage enhance the miniature effect in this image by Sebastian Bibb-Barrett, taken in Oregon. 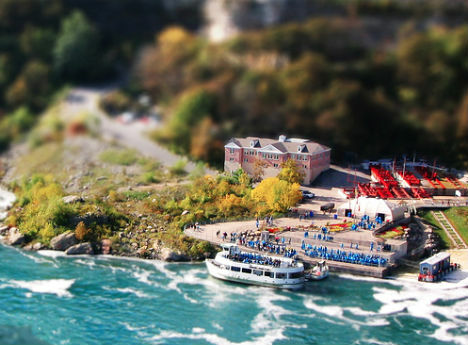 Looking at this image of passengers boarding a Niagara Falls tour boat, it’s easy to find yourself marveling over the incredibly realistic sea, or wondering what they used to create such tiny figurines of people, before remembering that it’s not actually a miniature. 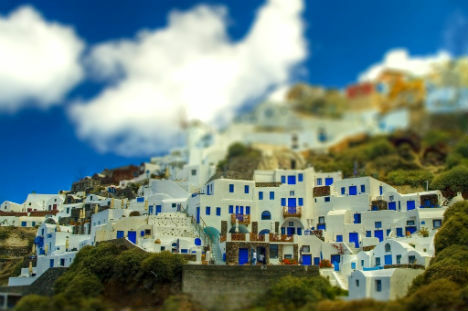 The blocky white architecture of Santorini, combined with the island’s saturated green landscape and brilliant blue sky, produce a stunning fake tilt-shift look in this photo by Steve Parkinson. How can such a large piece of equipment be artificially reduced to the size of a toy? 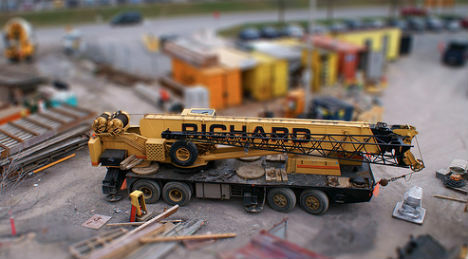 This crane looks like it belongs in the hand of a child. 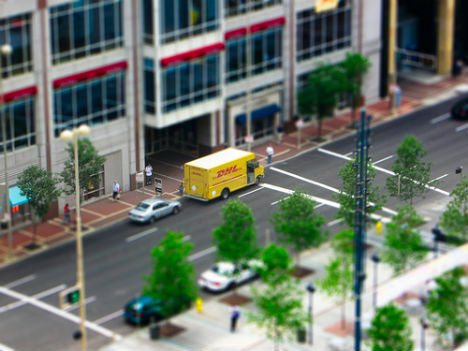 More seemingly fake plastic trees, along with a toy DHL truck, in this photo by Scot Campbell. 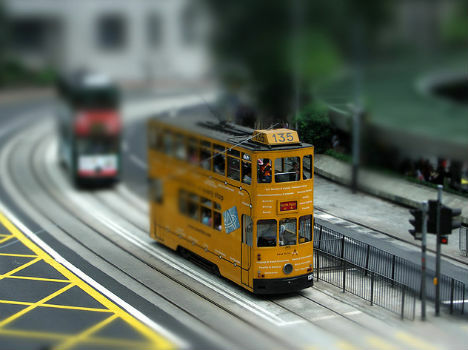 A double-decker tram in Hong Kong could easily pass as part of a toy train set in this image by Roy Wong. 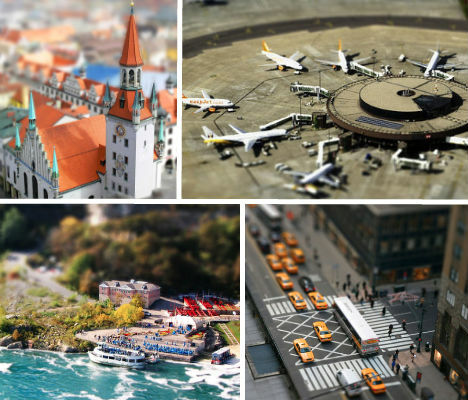 Those wanting to achieve the fake miniature look without an image editing program can get a similar result from a website called Tilt Shift Maker, which was used to edit this photo by Paulo Guedes.